Let’s play with BGP for a while. Remember, BGP is all about policy ;-). From now on we will focus on provider AS 1 only. These guys really take care about their customers. They are aware, that they should not announce the default without being capable to deliver the full service. In case their upstream fails or something really nasty happens in their core, they will not generate the default for their dual-homed customers. Let us take one step at a time. By the way, Juniper JUNOS uses an export policy instead of the “default-originate” hack. In JUNOS the policy defines how the default route is exported from a routing table to a BGP protocol. With “default-originate” the default route ::/0 is unconditionally announced to the customer. This is definitely not what we want to achieve :-(. The choice of the “signaling” prefixes in the route-map is important. If all of them are missing from the routing table, the default route will be dropped. We still assume that the default route is the only route that is being announced to the customer under normal circumstances. When the default is gone, the customer won’t be able to reach any part of AS 1 as well. Therefore, AS 1 might consider to announce all its internal address space and the address space of his other customers or private peerings to AS 300 along with the default route. But this is a whole new chapter, so let us stick to our simple example. The fix with a route-map does the job but there are other options. We can use iBGP to transport the default route within AS 1. Assuming that we have a default route in IGP, the BGP default route will not be used for the default routing within the AS (normally, BGP routes have lower preference than the IGP ones). The default route from BGP will only be used for conditional generation of the default route for the customers. Hence, we inject the default route into BGP conditionally, depending of our upstream reachability. Backup from "bgp 1 "
Responsible Generation of BGP Default. The ::/0 is being announced only if present in the routing table. As simple as that :-). Another alternative is to solve this by routing design. Put customer-facing routers into OSPF stub areas. Recall that OSPF inserts a default route if the stub area is connected to the backbone. Export that default route to the customer via BGP setting next-hop self. 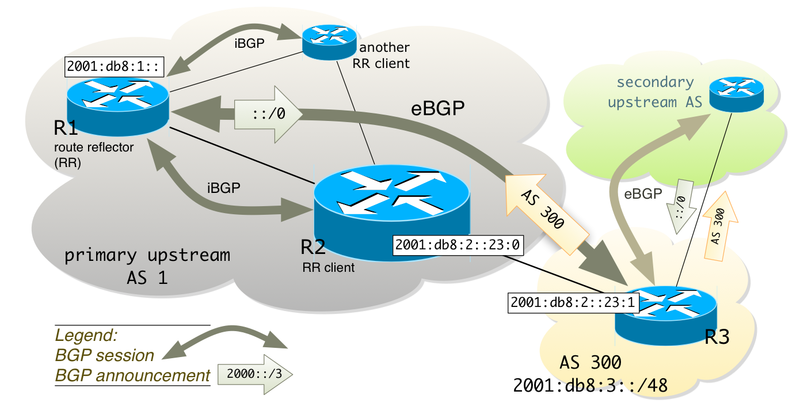 If the customer-facing router becomes disconnected from its backbone then the stub area removes the default route, and BGP withdraws the default advertisement to the customer. Is there a command example for XR-OS?